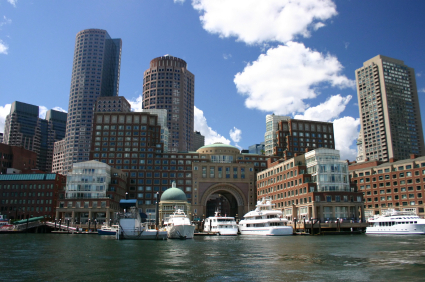 The Rowes Wharf Residences are ideally located on Boston Harbor. An architectural gem, this exquisite waterfront living establishment showcases a domed pavilion overlooking one of Boston’s most happening marinas. Centrally located near the Financial District, New England Aquarium, Freedom Trail and historic Faneuil Hall Marketplace, Rowes Wharf houses one of Boston’s most desired addresses. The main lobby in the Atlantic Avenue Building is secured by a 24-Hour concierge service where residents are formally greeted and given access to transportation. The prestigious Boston Harbor Hotel is located in the building’s main tower and residents are granted full access to all hotel amenities. The fully staffed Health Club and Spa includes a 60-foot lap pool, personal trainers, fitness classes, an aerobics room, exercise equipment and private locker rooms. The Meritage on-site restaurant specializes in fresh seasonal cuisine and its’ dinner presentations are nearly as perfect as its flavors. The restaurant’s 1500 bottled wine collection is housed in the restaurants on site wine cellar. Meritage’s reputation is truly set to match the residences at Rowes Wharf. I have a question about the property at 20 Rowes Wharf Boston MA 02110 (#72427406). I would like to schedule a visit for the property at 20 Rowes Wharf Boston MA 02110 (#72427406). I have a question about the property at 20 Rowes Wharf Boston MA 02110 (#72429203). I would like to schedule a visit for the property at 20 Rowes Wharf Boston MA 02110 (#72429203). I have a question about the property at 20 Rowes Wharf Boston MA 02110 (#72481113). I would like to schedule a visit for the property at 20 Rowes Wharf Boston MA 02110 (#72481113). I have a question about the property at 20 Rowes Wharf Boston MA 02110 (#72461212). I would like to schedule a visit for the property at 20 Rowes Wharf Boston MA 02110 (#72461212). Spectacular gut renovated 'Nose Unit' with panoramic views of Boston Harbor, this award-winning designed home boasts contemporary elegance with unparalleled craftsmanship. 2 Garage parking spaces, a large private terrace & balcony, and Boston Harbor Hotel 5 Star amenities, complete this elevated luxury residence. Features include: Open chefs kitchen with Carerra marble center island, brushed belvedere granite counter tops and backsplash, custom Italian kitchen cabinets and closet systems by Poliform, Subzero fridge, Miele appliances, and wine fridge. Spacious living room with wide oak flooring, Sonos surround sound, designer window treatments, LED recessed lighting, custom built in's with lighting. Guest Bedroom with custom built-in Murphy Bed. Master bath with Italian marble, radiant floor heating, and steam shower. Lutron LED radio - RA lighting system, CAD 6, upgraded plumbing and electrical. Rowes Wharf is a full service, doorman building. Parking is valet or self-park. I have a question about the property at 20 Rowes WHARF Boston MA 02110 (#72440678). I would like to schedule a visit for the property at 20 Rowes WHARF Boston MA 02110 (#72440678).